Regardless of if you say pə-TAY-toh or pə-TAH-toh, the pronunciations of ‘potato’ immortalized in the song “Let’s Call the Whole Thing Off“, the meaning of ‘couch potato’ remains the same: a typically inactive person who spends a great deal of time watching television. But to Austrian-born and Shanghai-based artist Jan Dornig the term meant something slightly different. To him, a couch potato was something “that is sort of cocooned and passive”, he discloses, “but not necessarily small or weak”. And these traits congealed into a character he’s designed, one that has since become known as the Potatoy form. Having “been a Sci-Fi fan since high school”, Dornig admits that he did consider going “to a fine art university” to pursue this interest but that he ultimately realized that studying industrial design was “a safer choice for the future”. After earning his bachelor’s degree in this field in 2011, Dornig undertook internships in Munich and Barcelona before being hired by an Austrian startup company that he’d worked with during his undergraduate studies. Reminiscing about how his time there “was extremely rewarding”, Dornig explains that they built “a small electric tracked vehicle” that “could be used by people with a handicap to increase their quality of life”. Opting in 2015 to attend graduate school, Dorning was accepted at Italy’s Politecnico di Milano, ultimately relocating to China as part of an exchange student program with Shanghai’s Tongji University. And it was at this point in his life that an interest in creating designer toys manifested, Dornig disclosing how “a lot of us industrial designers regularly check out what’s happening in the 3d design scene, and art toys borders [on] that as well”. But it was more than the sculptural forms and shapes that inspired him. “Storytelling, worldbuilding, those are common themes in art as well as design”, Dornig elaborates, “and with my love for sci-fi” as well as “an interest in gaming and game design, that all just checks off a lot of interesting aspects pointing toward art toys and the work around it”. “One of my classes in my graduate studies at Tongji University”, says Dornig, “asked us to create 3d printed furniture, leaving us basically free to do anything we want stylistically”. As “I had been waiting for an excuse to start making an art toy for a while”, he explains that this seemed like the perfect opportunity, one that presented itself in early 2017. Sketching a trio of characters under the title “The Couch Potatoes”, which Dornig clarifies were “literally the first lines I put down for this character idea within the project”, the artist further notes that the “main character that made it from the drawing into the real world also felt to materialize best my feeling of what a couch potato is”. Featuring minimal facial detailing, simply adding two small eye holes to the smooth head, Dornig’s creation had an urban aesthetic due to his hoodie attire as well as a lackadaisical atmosphere from its slightly slumped stance. “I wanted something relatable”, the artist elaborates, “something human but abstract enough to be moldable as an idea”. In April of 2017, Dornig began interpreting and evolving his concept digitally, all the preliminary design work created in the Rhino 3D rendering program. “Throughout the work on it”, Dornig admits, “I began to realize how interesting it is to go from an abstract concept to humanized object”. And the end result, in Dornig’s opinion, “is a piece of work that breathes life into an idea, a concept we are all familiar with”, but he also notes that “the figure explored the relationship between me and the idea of what is a couch potato”. A few months later, in July, Dornig took full advantage of the university’s facilities and began 3D printing renditions of his Potatoy form. “After the course, the project kinda stopped and faded out”, Dornig reveals. “I wasn’t connected to any art toy scene”, he continues, “or had anybody interested in that kind of work coming from me”. Discovering the Shanghai-based Shaving in the Dark collective, who irregularly produce an eponymously named zine-like compilation, Dornig contributed a piece titled “Human Experience” to their third issue. And, “through that group, I made some local connections, one of which later invited me to join an exhibition”, Dornig recalls. “This was actually in December [of] 2017”, he continues, and it was “the first time anybody ever called me an artist instead of a designer”. 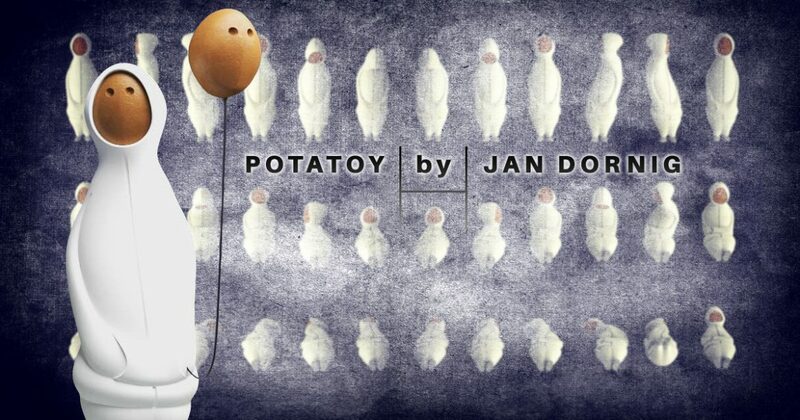 With the exhibition opening in January of 2018 at Shanghai’s Xintiandi Essence Cafe, Dornig remembers that he had “already made the [Potatoy] figure in about seven different poses” at that point, as well as two handmade renditions and a series of smaller sized prints. Smartly positioning the works throughout the space so that they appeared to be glancing at one another, gaining “suggested interactions” as Dornig refers to it, this heightened viewers’ ability “to see its humanity and relations”. Moreover, “I wanted to build a little Potatoy universe”, Dornig states, “and definitely immerse visitors as much as possible while facing the challenge of not being too figurative with things”. To partially achieve this concept, Dornig created “a ‘playable’ couch potato experience” with the help of some friends, an interactive work that allowed visitors to use an Xbox controller to virtually “walk the Potatoy character around a Potatoy sculpture garden”. While some attendees “have told me they feel that the work is about separation and disconnection”, Dornig explains, “others see it as something meditative and tranquil”, both of which fit into the artist’s own belief that his creation “gives an opportunity to confront a part of you, or at least the concept you have of it”. And since that initial opportunity to introduce the Potatoy to the public, other opportunities have arisen for Dornig. “I was welcomed by Soap Studio to show my figures at their booth at the Shanghai Toy Show in April”, he discloses, which was also the forms first proper introduction to an art toy audience. Though no works were available for sale at the time, Dornig received “some small but genuine interest in the figure”, as he recalls, the only problem being that “I had all these different poses on display and people actually showed interest in different ones”. Continuing to embrace the 3D printed origins of his Potatoy creation, Dornig returned to this method for a small made-to-order production, one that allowed collectors to select which stance they desired when placing their pre-order. Working with a company in China that printed the Potatoy forms in solid ABS plastic, Dornig elaborates that this gave “the figure a hefty weight and feels quite nice, almost like a rough ceramic”, with each of the roughly 7⅞-inch tall pieces being produced in multiple parts that were then hand-painted and assembled. But for those that missed this pre-order opportunity, Dornig says that he is currently “still figuring out how to get Potatoy in the hands of more people”. As for the future of the form, “I want to create more pieces that feature small scenes”, Dornig admits, and “the recently presented Balloon Potatoys are a foray into that”. Featuring a Potatoy character holding one or more balloons that resemble its own head, these Balloon Potatoys are a surreal interpretation of the groupings that potatoes actually grow in, which Dornig describes as similar looking to “a bunch of balloons on strings, just underground, dirty, and upside-down”. Not focused strictly on the vegetable aspect of his design, Dornig confesses that he wants “to do a couple of painted versions” of his creation, renditions that overlay pop culture referential designs onto his character. With decorative examples ranging from mimicking a Campbell’s Potato Soup can to Pokémon‘s Pikachu, from Supreme streetwear branding to Hayao Miyazaki‘s Totoro, Dornig explains that “a couch potato is something that consumes the media around it”, making his Potatoy an ideal canvas to reflect the media that consumes mankind’s time and thoughts. And while Dornig “would love to see interest rise in a way that makes a small ‘mass production’ viable”, the artist notes that “I am definitely going to make more individual [Potatoy] pieces, no matter what”.